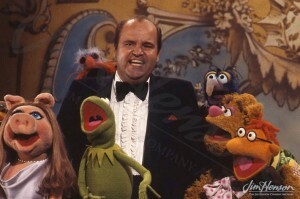 After having to woo celebrities to serve as guest stars on the first season of The Muppet Show, Jim found that for the second season, celebrities were coming to him. The roster of names for Season 2 was impressive, including established stars like Milton Berle, Julie Andrews, and Peter Sellers, and younger talent like Steve Martin and Bernadette Peters. Dom DeLuise fit into the first category – a star of Broadway and a regular on the variety show circuit in the 1960s and early 1970s, DeLuise was well-known and much loved. He may have heard what fun it was on set from his friend Ruth Buzzi who starred in Season 1 or known how many other veterans of Mel Brooks’s films would perform on the show, and was encouraged to head to London in August 1977 for the shoot. DeLuise’s broad comic personality meshed well with the Muppets, and he was a good sport – willing to do just about anything. On the show, he visited the planet Koozebane and became acquainted with the locals, had an altercation with a group of monsters, and after being on the receiving end of Miss Piggy’s karate chop, made up with her enough to sing a duet of the Walter Marks song, “We Got Us”. The following summer, he shot a scene for The Muppet Movie, appearing as Bernie the Agent, luring Kermit from his home in the swamp to the bright lights of Hollywood. 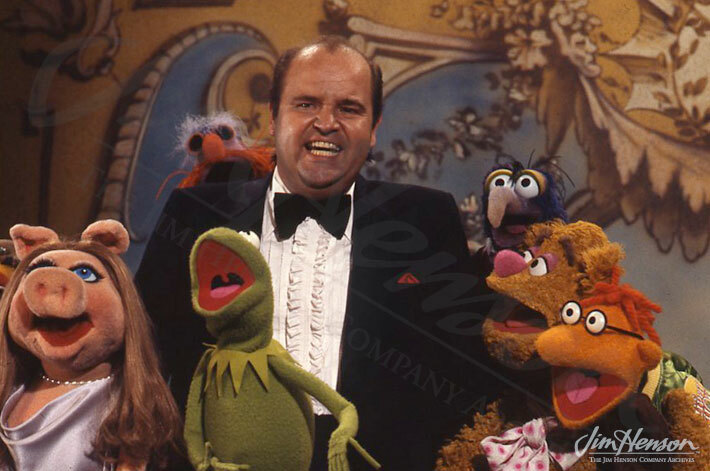 Dom DeLuise among friends on the set of The Muppet Show, 1977. Jim’s concept as illustrated in his Muppet Show proposal, early 1970s, similar to the Koozebanian scene with Don DeLuise. This entry was posted in 08-August '77, 1977, Muppet Movie, Muppet Show and tagged Bernadette Peters, Bernie the Agent, Dom DeLuise, Frank Oz, Julie Andrews, Kermit, London, Mel Brooks, Milton Berle, Miss Piggy, Peter Sellers, Ruth Buzzi, Steve Martin, Walter Marks. Bookmark the permalink.